This fan brush can be used to create a number of different make-up effects. When loaded with multiple colors it can be used to create a rainbow or gradient effect. With a gentle twist while brushing you can create a butterfly effect. 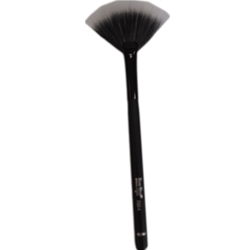 This brush can also be used in conjunction with powder brushes to gently sweep away excess powder without affecting the surrounding makeup application.